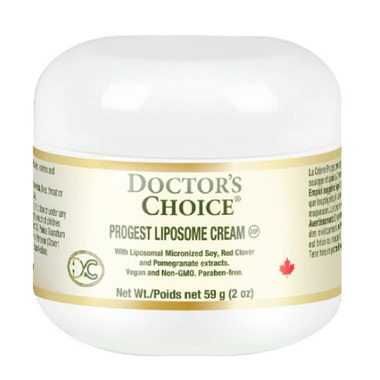 Doctor’s Choice Progest Liposome Cream is an excellent option to help balance the female hormones during the different phases of the cycles of life, from menstruation to menopause. The silky, luxurious texture of this all-natural cream makes “taking your medicine” a delight. To use this female balancing cream, massage it into your skin until it is noticeably absorbed. Progest cream can be applied to any area of the skin, such as the chest, breasts, lower abdomen, inner thighs, wrists/inner arms, and neck. It is recommended that you periodically rotate the area of the body where the cream is applied. Some women notice results from using Progest cream immediately, and for others it may take a few weeks. ProGest cream is absorbed into the skin and taken up by the fatty layer beneath; it is then transferred into the bloodstream, where it circulates to receptor sites throughout the body. Dosage: Apply ½ teaspoon of cream twice daily into smooth skin areas such as wrists, face, throat, or chest. For topical use only. Do not use on mucous membranes. Individual needs may vary.